The works that comprise Isabelle Andriessen’s installation Tidal Spill defy the expectations of permanence typically associated with sculpture. They sweat, set, and leak. They are also intimately connected: when one oozes a chemical substance, others respond with surface oxidation and crystallization. 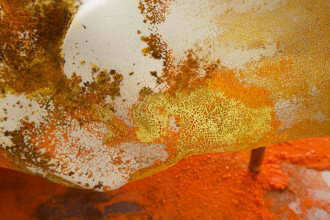 These changes are the result of mechanical and chemical interventions by the artist, who is interested in how materials perform and transform while being exhibited and stored. Ultimately, Tidal Spill operates as a living system in which individual sculptural components interact with one another in ways that exceed human mediation. By insisting that her sculptures possess agency, Andriessen disrupts the distinction between human and object that has historically characterized artistic production and reception. 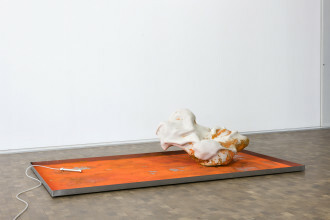 Isabelle Andriessen, ‘Tidal Spill’ (series of 4), 2018, ceramics, aluminum, metal, chemicals, courtesy the artist © Pierre Antoine. Their skin-like ceramic surfaces display signs of fever, tumors and rashes, as if infected with a virus. Andriessen calls these works “zombie sculptures” due to the ways in which their human-like metabolisms explore divisions between the living and non-living. In appearing to suffer from an unidentifiable disease, the sculptures mirror the processes through which organic and inorganic matter engender new forms of life. 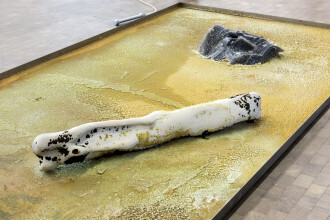 Through Tidal Spill, Andriessen considers what the environment might look like in a distant future where humans have disappeared but synthetic materials such as plastics, aluminum, rubber, and other artificial, non-biodegradable chemicals continue to exist. She imagines this landscape, populated with the byproducts of manufacturing and industry, as a kind of grim sublime. Andriessen’s individual sculptures incorporate a wide range of media, each of which have a differing relationship with time and the environment. Earthy, prehistoric materials like ceramics are combined with metals and industrial plastics, enabling a single work to simultaneously encompass past, present, and future. Through them, the artist advocates for a greater understanding of how time affects man-made materials in varying and often unforeseen ways. 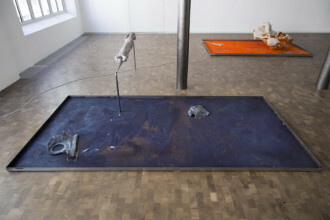 The artist further dissolves separations between her work and its surroundings through elements such as scent and sound. Through this body of work, Andriessen acknowledges that objects can be productive actors in their own right, and questions art histories that privilege human subjectivity. Isabelle Andriessen (b. 1986, Netherlands) studied at the Gerrit Rietveld Academie in Amsterdam, the School of the Art Institute of Chicago, and the Malmö Art Academy. Recently she was in residence at the Rijksakademie van Beeldende Kunsten in Amsterdam. Her work has been exhibited at venues including Lafayette Anticipations, Paris; Hotel Maria Kapel, Hoorn; CAB Art Center, Brussels; Van Abbemuseum, Eindhoven; Galleri CC, Malmö; and Skulptur Bredelar.